Pride of America is now essentially a new ship after an extensive renovation completed in March. Staterooms aboard Pride of America received new bedding, new furniture, new flat screen televisions and updated flooring. The pool area, public areas and restaurants have all been done over to create a more upscale feel…even the menus are new! The Pride is the world’s only US-flagged cruise ship, which allows her to spend 100 hours in port…lots of time to explore each island. She sails year round, on a 7-night cruise of the Hawaiian Islands, including overnights in Maui and Kauai. A very special part of the cruise is an afternoon sail along the spectacular Napali Coast. The Napali Coast is breathtaking and the only way to see it is by boat or by air. I have sailed on the Pride of America and loved how much time I had on each island, very different then most cruises where you spend a few hours in each port. 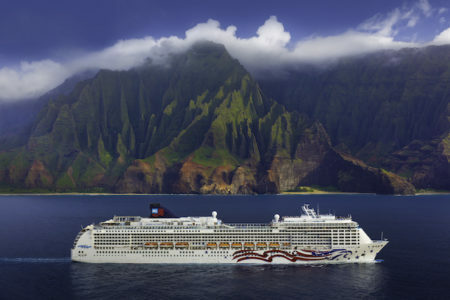 Visit the enchanting islands of Hawaii aboard this beautiful ship…unpack once and enjoy!